Each patch may have a list of up to 128 names for notes. Usually, note names are labels for percussion instruments. For example, the pitch C3 may really be “Kick Drum,” and D3 may be “Snare.” Because a drum machine may provide different drum kits for each patch, SONAR lets you specify a different list of note names for each patch. The Piano Roll and Event List views show you these note names. You can assign a note name list to each patch. You can also assign a default note name list to the instrument, which is used for all patches for which you haven’t assigned a specific note name list. Each patch can also be assigned a special Drum flag, which indicates that this patch contains drum sounds. If you set this flag, the Piano Roll view will display drum notes as diamonds, and the Staff view will use percussion notation. Expand the instrument definition by clicking the + sign next to the instrument name. Expand the Patch Names for Banks folder by clicking the + sign. Continue expanding the tree by clicking the + sign, until the tree is fully expanded. 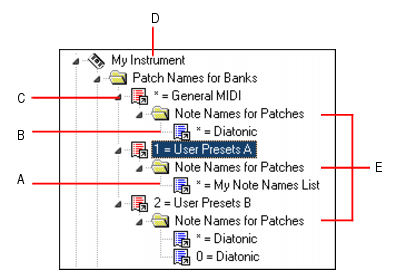 Drag a note name list from the Names tree onto the Note Names for Patches folder of the instrument and bank you’re editing in the Instruments tree. Enter the patch number that should use these note names, or enter -1 to indicate that this list of note names should be used as the default. SONAR displays the updated patch and note name lists. If necessary, SONAR adds a new patch to the instrument definition. In the Instrument tree in the Note Names for Patches folder of the instrument you’re editing, highlight the name of the note names list (for example, “diatonic”). Press the DELETE key, or right-click on the note name list and choose Delete from the pop-up menu. Right-click on the patch in the Instrument tree, and choose Drums from the menu.